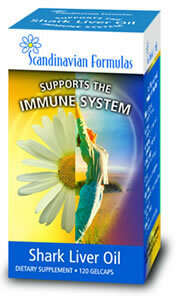 Supports the immune system with the highest natural concentration of Alkylglycerols. SCANDINAVIAN FORMULAS' SHARK LIVER OIL is a trusted product, extensively purified and having the highest known concentration of Alkylglycerols that support the body’s natural defense mechanisms. Shark liver oil has a very long interesting and fascinating history. We do not know exactly when oil from shark liver was used the first time within the popular medicine, probably many centuries ago. However, we do know that in ancient times the oil played an important role for the fishermen, especially in the Atlantic coast of Norway and Sweden. Alkylglycerols can be found in all mammals’ blood producing organs. In humans alkylglycerols occur naturally in mother’s milk, bone marrow, liver and in the spleen. The highest concentration of alkylglycerols in nature is found in shark liver oil. When comparing mothers milk to cow milk it was found that the content of alkylglycerols was ten times higher in mothers milk than in cows milk. The content of alkylglycerols in mother’s milk became a target when setting the recommended dosage. SCANDINAVIAN FORMULAS' SHARK LIVER OIL'S alkylglycerols are derived by a unique process from the liver of sharks from the Arctic Sea. Unprocessed shark liver oil contains up to 40% alkylglycerols. The purified shark liver oil in this product contains a minimum of 20% alkylglycerols and unwanted components such as squalene, cholesterol, vitamins A and D have been reduced to a minimum. Impurities such as DDT, PCB and heavy metals have been removed.